﻿ NOSE JOB WITH NO SURGERY! NOSE JOB WITH NO SURGERY! Why spend several weeks after surgery recovering from bruising, swelling, discomfort, congestion, and difficulty breathing when you can get a 5-minute non-invasive nose job? Let’s not forget about the risk of general anesthesia, infection, and the cost of surgery itself! 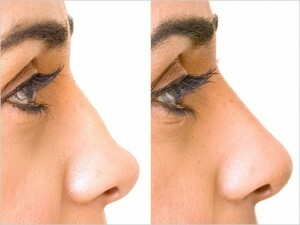 Anand Medical Spa is proud to offer it’s 5 minute non-surgical nose job. With a few simple injections using dermal fillers such as Juvederm, we can correct any nasal asymmetry, indentations or help enhance the shape of your nose. Dermal fillers also know as “the liquid facelift”, are made of hyaluronic acid, a natural substance found in the body that can be injected and then molded to create volume, structure, lift, and/or enhancement to one’s features without invasive surgery. Dermal fillers provide gorgeous results simply through a few injections, making fillers a highly appealing alternative to surgical procedures. In addition to shaping your nose, dermal fillers can also be used to help soften smile lines, reduce the appearance of wrinkles around the lips, enhance the lips and cheekbones, and augment the chin. The procedure takes only minutes to perform, is relatively inexpensive, and the results are immediate and typically quite impressive. The best part is you can go to work the next day and not worry about wearing a cast!